At Family Video stores across Western New York, you can pick up a Disney DVD for your toddler, an Xbox game for your teen and a bottle of CBD oil for your arthritis. Products made with the cannabis extract cannabidiol are popping up in the most unusual places. Head shops and vape stores, sure, but pet stores? Gas stations? The video store? The extract doesn’t make you high but reportedly eases inflammation, headaches, nausea and seizures, among other things, though there isn't much scientific research to back up those claims and some experts are skeptical. Even so, it has been widely embraced by consumers and, in turn, is a trendy ingredient turning up in everything from dog treats and bath bombs to shampoo and socks. Now, changes in cannabis regulation are expected to open the floodgates on such products – bringing about new varieties, better access and higher quality – while also providing some oversight and structure to the market. Nationally, CBD sales are expected to hit $22 billion by 2022, according to cannabis industry analyst firm Brightfield Group. Family Video, a movie and game rental chain, has had to get creative in order to thrive in the age of Netflix and YouTube. 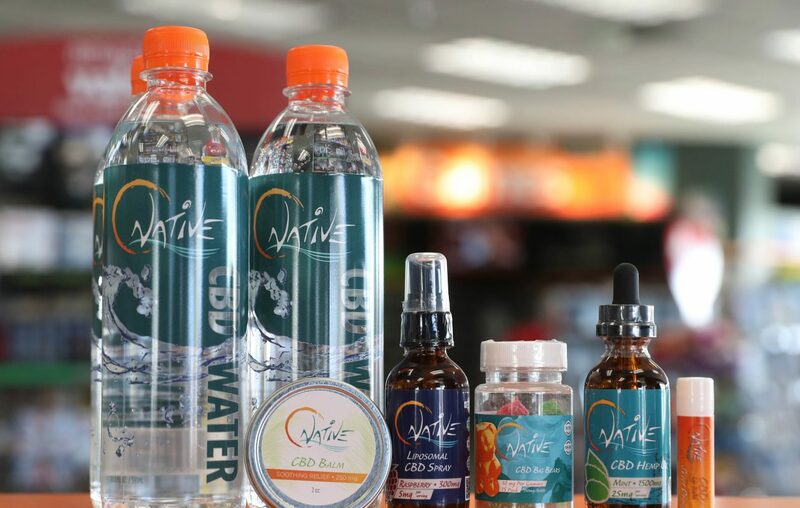 Its latest attempt is to add CBD sales to its repertoire. Advertised with giant signs in its windows, it has a display inside by the cash register but keeps the real thing behind the counter. The company began selling CBD chapstick, water, balm, oil and spray in Western New York just before Christmas. "A couple people find it weird that we're selling it here. They say, 'If it's medicinal, shouldn't it be at the pharmacy?' " said Pam Dulanski, one of the store's managers. "But mostly people are excited that they can get it. It's convenient." Dulansky has begun seeing repeat customers who say they're treating everything from anxiety to cancer, and said sales have become "a really big deal." Products range in price from about $3 to $150. Vincent Ciffa recently caused a stir on Hertel Avenue advertising free CBD samples from his store, Clean Green Mart and Café. The simple storefront sells CBD oil and other products, including cold coffees and honey sticks with CBD. “For people who have never heard of CBD, the best way to get it out there is to give a free sample,” he said. As the products become ubiquitous, getting a sample is becoming easier. Discount Diva: How the heck is Family Video still around? Polish Cadets, a Black Rock social club, stocks hemp-infused vodka. The Lexington Co-op will begin selling balms and tinctures next week. Niagara Street kombucha factory Bootleg Bucha makes a hemp kombucha that customers have sworn eases their joint pain. Even your pets can have a try. Blackwinds Pet Supplies, a Town of Tonawanda pet store, stocks CBD dog chews and gel capsules. The problem, experts said, is that there is little oversight to make sure that consumers are getting safe, effective products. Hopefully, rapidly changing legislation will change that. And there is scant scientific evidence on the effectiveness of CBD or its side effects. "This is all evolving in front of our eyes over the last 10 years," said Dr. Laszlo Mechtler, a neuro-oncologist and director of the Cannabis Clinic at Dent Neurologic Institute. A panel convened by the National Academies of Sciences, Engineering and Medicine in 2017 looked into the effects cannabis and cannabinoids have on health, but most of the 10,000 studies they examined focused on marijuana rather than CBD. The panel found only a few small clinical trials on CBD and concluded that there wasn't enough evidence to determine its effectiveness in treating conditions like insomnia and Parkinson's disease, and only limited evidence on its ability to treat anxiety. The Food and Drug Administration last year approved a CBD concentrate, Epidiolex, as a treatment for two rare types of epilepsy. Without regulation and third-party testing, there's no guarantee that a product actually contains CBD, or that it contains the dosage and ratio it advertises. Mechtler's colleagues have tested products and found that they were improperly labeled about 70 percent of the time, he said. CBD products are also not widely tested for contaminants, pesticides or heavy metals. "With the lack of federal and state regulations, you don't know what you're getting. It's a crapshoot," Mechtler said. "People are paying a lot of money and just hoping for actual CBD." CBD producers operated in a legal grey area until last year, when President Trump signed the federal Farm Bill. The bill legalized hemp, a form of cannabis with very low levels of THC. THC is the component of cannabis that makes you feel high. Well before the farm bill, New York was fostering the production of industrial hemp through a pilot program launched in 2015. Hemp is used to make some 25,000 products – clothing, food, building materials, pharmaceuticals – and is poised to become a growth crop in the state, according to Empire State Development. As part of the pilot, the state let certain educational institutions grow hemp and conduct research, but then expanded the program to let farms and businesses seek permission to do so as well. The state even offered grant money to help kick them off. The CBD oil Ciffa, the Hertel Avenue business owner, sells at Clean Green Mart and Café is grown at a site in Eden authorized to grow hemp, Weiss Farms. Buffalo natives Emily and Morgan Paxhia founded California-based Poseidon Asset Management in 2013 to invest exclusively in the cannabis industry. As a pioneer, Poseidon's portfolio is deep and multifaceted, but in Western New York, you can see its influence at medical marijuana dispensary MedMen, which acquired the PharmaCann dispensary brand in which it invested. It also is an investor in Canopy Growth, a Canadian cannabis company that just announced plans to spend at least $100 million in a hemp production and processing project in New York State. New York long ago decriminalized small amounts of marijuana. It later legalized medical marijuana, and Gov. Andrew M. Cuomo has called for legalizing recreational marijuana – a step already taken by a handful of states. Businesses are seizing on potential opportunities in New York. Florida-based Jushi Inc. announced this week it will turn a post office on the East Side into a CBD production facility that will provide discounted products to patients at DENT Neurologic Institute. Also recently, Zephyr Partners, a San Diego company that includes a son of Buffalo developer Rocco Termini, said it wants to build a high-tech "cannabis campus" to grow both recreational and medicinal marijuana in South Buffalo. The investment and legalization are good signs, said Dr. Mechtler at Dent, who is feverishly publishing medical research about cannabis that was impossible to conduct for decades. He is also part of a team that meets with the state's cannabis committee. "I've been very impressed at how receptive they've been to our concerns and feedback," he said. "I think things are moving in the right direction." Reporter Matt Spina contributed to this story.